Detox Water Recipes: In a lifestyle ridden with erratic sleep patterns, irregular eating habits, a largely unhealthy diet and increased stress, we all need to detox once in a while to cleanse our body and refresh the mind. Detoxing the body has become a trend due to lifestyles that may lead to an increase in multiple health risks. So what exactly is detoxification? As the name suggests, detox is merely flushing out toxins from the body. These toxins may have harmful mental, metabolic and reproductive health effects which in serious cases may also lead to increased risks of cancer. Though our body is fully capable of getting rid of these toxins naturally through urine, liver, etc., these are consumed by our body in high amounts due to the increased exposure to pollution, preservatives and pesticides. These may get stored deep into the tissues and cells of our body and may eventually hamper our bodies’ physical and mental capabilities and may slow down the functioning of our system. A detox regime cleanses our vital organs off toxins and helps the natural pathways of the body to appropriately flush the toxins out. It provides a host of benefits including weight loss, improved digestion, better functioning of liver, reduced inflammation and a boost of energy. Detox drinks are fast becoming the most preferred way to crack through harmful toxins and prevent health problems. Detox drinks are prepared using Ayurvedic herbs as well as antioxidant-rich fruits and vegetables and these can be included in our diets to flush out the harmful toxins. This one is a refreshing and easy detox recipe that you can prepare in just 10 minutes, using just four ingredients. Coconut water being a naturally refreshing drink consists of various minerals and vitamins that help replenish the electrolytes in the body which hydrates it and also keeps us fresh throughout the day. This detox water recipe has fresh mint leaves along with the sweetness of honey and tanginess of lime. You are just four ingredients and 15 minutes away to attain bliss! Here is a perfect blend of fruits and herbs along with the wonder summer vegetable- cucumber. 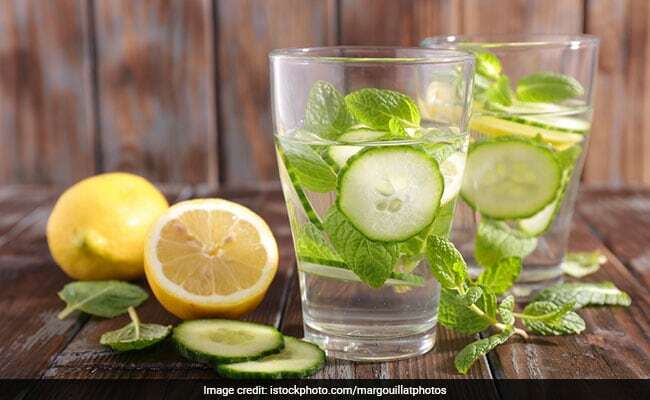 Having close to 90% water, cucumber is known to be one of the most hydrating veggies out there and hence, it is the best choice to prepare detox drinks and summer quenchers! Tanginess of Thai ginger, cucumbers and kiwi topped with bean sprouts is the perfect one to detox. Apart from being the go-to summer drink for scores of people around the world, nimbu paani or lemonade or shikanji is one of the most delicious and easiest coolers to prepare at any time of the day. It is packed with the tangy lemon flavour and refreshing mint leaves accompanied with spices to add a boost of flavour and nutrition. Here is a 3 way recipe that you can prepare using lemon in a matter of just few minutes. One of the most common summer quencher is also the perfect detox drink to sip on. This drink is a fizzy, lemon drink to rejuvenate your body and flush out all the toxins. It has refreshing mint leaves muddled well with lemon, sugar and water and is the perfect makeover of nimbu pani with soda and mint. Nimbu pani gets a makeover with soda and mint. An Ayurvedic treat, this detox recipe is a blend of antioxidants like turmeric (haldi) with spices such as ginger and black pepper along with honey, that is sure to do wonders for your body. Turmeric is considered to be a powerful cleansing spice and hence it is recommended for all detox diets. A perfect combination of antioxidant and anti- inflammatory ingredients. Photo Credit: NDTV Beeps.